The 1303 Hongdong earthquake occurred in China, then part of the Mongol Empire, on September 25. The shock was estimated to have a magnitude of 8.0 and it had a maximum Mercalli intensity of XI (Extreme). With catastrophic damage, it was one of the deadliest recorded earthquakes of all time. Because of the time period in which it struck, very little is known about the nature of the earthquake. However, its epicenter was almost certainly located somewhere in what is now Shanxi (山西) province, near the present-day towns of Hongdong (洪洞) and Zhaocheng (赵城). The earthquake likely occurred on the Taigu fault zone in Shanxi, and several scarps and uplifts of local faults were seen as evidence of this; the Taigu fault zone has not experienced any measurable activity since the 1303 earthquake. The magnitude was calculated by modern seismologists to be 8.0 on the moment magnitude scale, though it is impossible to say for sure due to lack of accurate geological data. Devastation was widespread throughout the area struck by the earthquake. In the nearby towns of Zhaocheng and Hongdong, every major temple and school building collapsed and over half the towns' populations perished. Every building in Huo county, Shanxi was destroyed. In Taiyuan and Pingyang, nearly 100,000 houses collapsed and over 200,000 people died from collapsing buildings and loess caves in a similar manner to the situation that would be experienced 253 years later in the 1556 Shaanxi earthquake (陕西). Cracks in the ground turned into miniature rivers, and many canals in Shanxi Province were destroyed, along with city walls. Some reports stated that the earthquake even leveled mountains and hills, altering the topographic makeup of the region. Landslides and soil subsidence and liquefaction triggered by the shaking were a likely root cause of these large-scale environmental changes. Rebuilding was generally slow, owing to the destroyed infrastructure of Shanxi and was interrupted by several other earthquakes in the following years. Some records state that another similar earthquake occurred in August 6, 1303 which may have been an aftershock of the Hongdong earthquake. [dubious – discuss] Once again, Taiyuan and Pingyang suffered massive damage along with the area surrounding the temple of Emperor Yao, and over 100,000 people were said to have died. However, rebuilding had been largely completed within nine months. The 1303 Hongdong earthquake, though currently the last to have occurred on its fault system, marked the start of a centuries-long episode of heightened earthquake activity throughout China, the first of several to occur up to the end of the twentieth century. 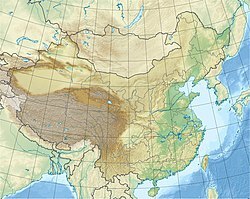 It was also the first of many examples of earthquakes that demonstrated the tendency of earthquakes in China to strike near loess plateaus. ^ a b c Xie, Xin-sheng; Jiang, Wa-li; Wang, Huan-zhen; Feng, Xi-ying (2004). "Holocene activities of the Taigu fault zone, Shanxi Province, and their relations with the 1303 Hongdong M=8 earthquake". Acta Seismologica Sinica. 17 (3): 308–321. doi:10.1007/s11589-004-0053-x. ^ a b c Stein, Seth; Mazzotti, Stéphane (2007-01-01). Continental Intraplate Earthquakes: Science, Hazard, and Policy Issues. Geological Society of America. ISBN 9780813724256. ^ a b c d "Ruins of the Hongdong Earthquake(1303)". www.kepu.net.cn. Retrieved 2015-11-28.